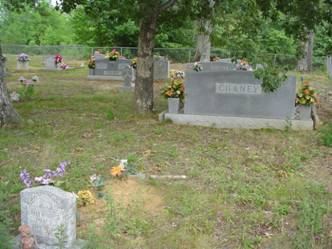 To reach this cemetery travel east from Cloverdale, Alabama on County Rd. # 8 for ¾ mile and turn left on County Road # 139 and go about 1-½ miles to the church. The Johnson Crossroads Baptist Church (SBC) is on the right side of the road and the cemetery is to the right and slightly back of the church. 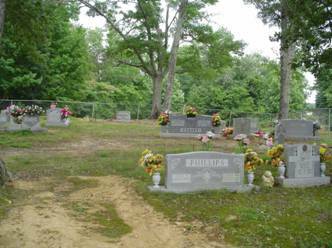 The cemetery is located at 1470 County Road # 139, in the Johnson Crossroads community northeast of Cloverdale, in Lauderdale, County Alabama. The church was established in 1904. Chaney, Eva M., b. 25 Oct 1905, d. 09 Aug 1997, wife of George R.
Chaney, George R., b. 28 Feb 1905, d. 20 Jul 1967, husband of Eva M..
Chaney, Ila Alene, b. 04 Sep 1905, d. 19 Feb 1985, wife of Jimmy M.